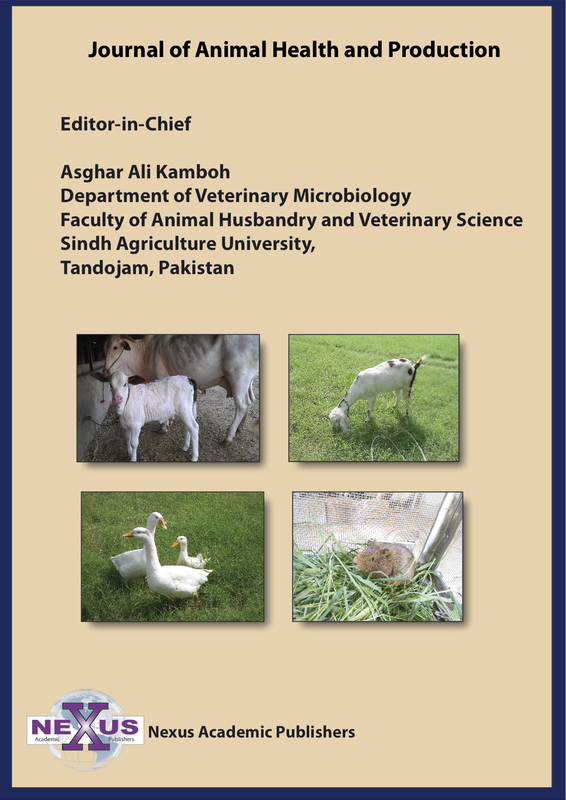 1Department of Animal Nutrition, College of Animal Sciences and Technology, Northwest A&F University, Yangling, China, 712100; 2Faculty of Veterinary and Animal Sciences, Lasbela University of Agriculture, Water and Marine Sciences, 3800, Uthal, Balochistan, Pakistan; 3Department of Veterinary Microbiology, Faculty of Animal Husbandry and Veterinary Sciences, Sindh Agriculture University Tandojam 70060, Pakistan; 4Faculty of Agriculture, Lasbela University of Agriculture, Water and Marine Sciences, 3800, Uthal, Balochistan, Pakistan; 5Young Researchers and Elite Club, Tabriz Branch, Islamic Azad University, Tabriz, Iran; 6Department of Poultry, Faculty of Agriculture, Zagazig University, Zagazig, 44511, Egypt. Abstract | Propolis is a resinous beehive product also known as bee glue that is collected by honeybees from several plants. Honeybee insects blend this viscous and non-toxic substance with the help of their salivary gland secretions and flecks of wax produced by special abdominal glands. It possesses valuable properties such as immuno-modulatory, anti-inflammatory, hepatoprotective, anti-oxidative, antiviral, antibacterial, antifungal, antitumor and cardio-protective. A substantial amount of literature has documented its positive effects on poultry regarding growth, immunity, meat quality, microbiota of gastrointestinal tract, and blood hematology. Propolis contains about 200-300 natural compounds. Its biological and pharmacological properties are mainly due to the presence of a great amount of polyphenols including flavonoids, triterpenes, phenolic acid esters (ferulates and caffeates), aromatic acids, diterpenic acids and lignans as well. Currently, most of the interesting research has been focused on biological properties of propolis and its potential health promoting effects in humans, livestock animals and poultry. 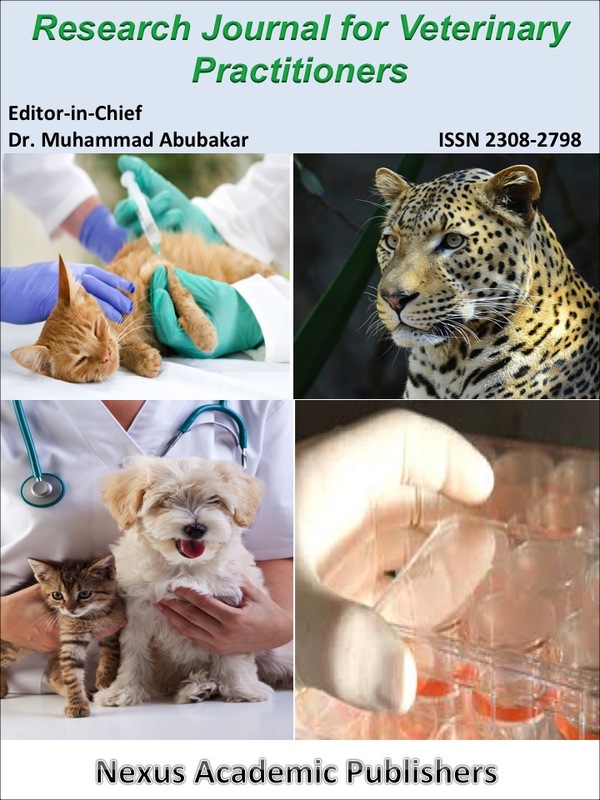 Therefore, this review aimed to explore the nutritional and medicinal importance of propolis as a safe feed supplement for the improvement of poultry health and performance as well as an alternative of the synthetic antibiotics growth promoters which are worldwide banned. Citation | Saeed M, Arain MA, Kamboh AA, Memon SA, Umar M, Rashid M, Babazadeh D, El-Hack MEA, Alagawany M (2017). Raw propolis as a promising feed additive in poultry nutrition: trends and advances. J. Anim. Health. Prod. 5(4): 132-142. Copyright © 2017 Saeed et al. This is an open access article distributed under the Creative Commons Attribution License, which permits unrestricted use, distribution, and reproduction in any medium, provided the original work is properly cited. The European Union has banned the supplementation of antibiotic growth promoters (AGPs) in poultry feed industry since 2006 (Kara et al., 2014; El-Hack et al., 2016). Moreover, the concerns about the possible toxic effects of synthetic feed additives, in many parts of the world has led manufacturers to seek for alternative natural feed additives. Poultry nutritionists have exerted great efforts to find natural products that could cause an improvement in growth, feed utilization, meat quality and immune system maintenance in turkeys, broilers and laying hens (Nghonjuyi et al., 2015; Salah et al., 2015; Ahossi et al., 2016; Orayaga et al., 2016; Raheema, 2016; Aguihe et al., 2017). Currently, many studies have documented the importance of natural feed additives as alternatives for antibiotics in different avian species and have shown positive effects (Ashour et al.,2014; Saeed et al., 2015, 2017a; El-Hack et al.,2016; Arain et al., 2017; Saeed et al., 2017b,c,d,e, f, g). Bee products have been extensively used in traditional folk medicine. There is a new promising insight in the research of bee products like: propolis, pollen, bee venom, honey, and royal jelly (Seven et al., 2014). The raw materials, crude extracts and purified active compounds of bee products have been found to exert antioxidant, antimicrobial and anti-inflammatory properties (Premratanachai and Chanpen, 2014). The propolis is a sticky resin material produced by the worker honey bee from the substances that are collected from different plants (Aygun et al., 2012). In animal research studies, it has been indicated that propolis may help to improve the detrimental effects of oxidative stress on the body’s defensive system (Mannaa et al., 2011; Seven et al., 2012b). Propolis contains about 300 constituents (Seven et al., 2012b) and its chemical properties and composition depend on the various types of pollens, vegetation, from which the honey bee insects have collected the exudates.Thus, the biological properties of propolis are strictly associated with the topographical site which can impact propolis ability to exert health promoting effect in poultry when it is fed as a dietary supplement (Bankova, 2005). The compounds contained in propolis (mainly flavonoids) are used in various pharmacological and biological products and play an important role in maintaining anti-inflammatory, anticancer, antimicrobial and antioxidant activities (Seven et al., 2012; Aygun et al., 2012). Moreover, some experiments showed that propolis could ameliorate the adverse effects of oxidative stress that are caused by factors like heat stress and stocking density (Arslan et al., 2014; Hosseini et al., 2015; Mahmoud et al., 2015a). Dietary additives based on propolis have already been used in broilers as growth promoters, immunity enhancers and/or antioxidant agents (Seven et al., 2008). Blood parameters like triglyceride and cholesterol concentrations were remarkably lowered in broilers that were continuously supplemented with 300 mg/kg of propolis for 35 days (Attia et al., 2014) and in laying hens that were daily fed with 100 or 150 mg/kg propolis for eight weeks (Galal et al., 2008). These findings are possibly a result of the strong antioxidant potential of propolis that can lead to improved biological functions (liver morphological structure and lipid metabolism) (Babinska et al., 2013). Seven et al. (2012a) also recommended that the positive effects of bee propolis on nutrient digestibility could be related to its promising palatable, anti-oxidant, antimicrobial, and/or immunomodulatory properties. The antioxidant ability of propolis is based on its phenolic compounds including flavonoid, phenolic acid, caffeic acid, phenethyl ester and terpenoid contents (Wang et al., 2004), that improve glucocorticoid receptor activity in the hippocampus, and reduce the generation of ROS (reactive oxygen species) molecules and serum corticosterone level, thus ameliorating stress effects (Lee et al., 2013). Therefore, the aim of this review article is to highlight the reported promising effects of propolis as a natural feed additive and its capacity to replace the synthetic growth promoters in poultry nutrition. Propolis is a complex substance with a variety of chemical components that depends on the time of collection, floral type, geographic origin and tree species used for exudate collection (Crane, 1990; Bankova, 2005). The substances typically found in fresh propolis are presented in Figure 1 and briefly are bee-wax (7%), bee-pollen (5%), resin - polyphenolic fraction (55%), aromatic essential oils (30%), and other minor components (3%) like vitamins (A, C, D, E and B1, B2 and B6), niacin and folate, and some micro and macro minerals like iron, calcium, copper, nickel, zinc, magnesium, manganese, vanadium, strontium and cobalt (Bankova, 2005; Castaldo and Capasso, 2002). The major ingredients found in propolis are phenolic compounds, flavonoids, and their terpenes and esters (Nolkemper et al., 2010). In addition, propolis also contains glucosidases. The propolis flavonoids belong to numerous subgroups like flavonols, flavones, isoflavones and flavanones dihydroflavonols (Marcucci et al., 2000; Gardana et al., 2007). The pharmacological and biological activities of propolis absolutely depend upon the ratio of its chemical constituents. 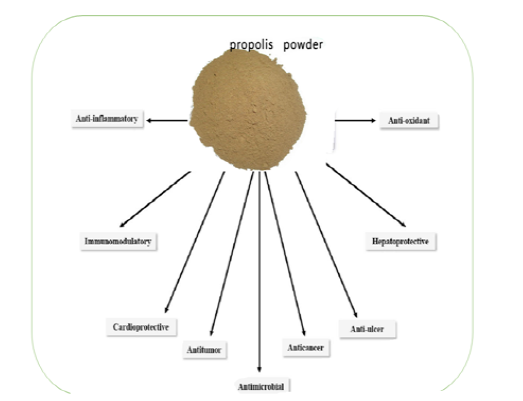 Propolis possesses many properties like antibacterial, antiviral, antifungal, immuno-modulatory, hepatoprotective, antitumor, anti-inflammatory, anti-ulcer, cardio-protective and anti-oxidative as illustrated in Figure 2. Due to its multipurpose health properties, propolis appears to induce potential benefits for both human and animal health. Recent literature has sufficiently documented the immuno-modulatory activities of propolis (Table 1). 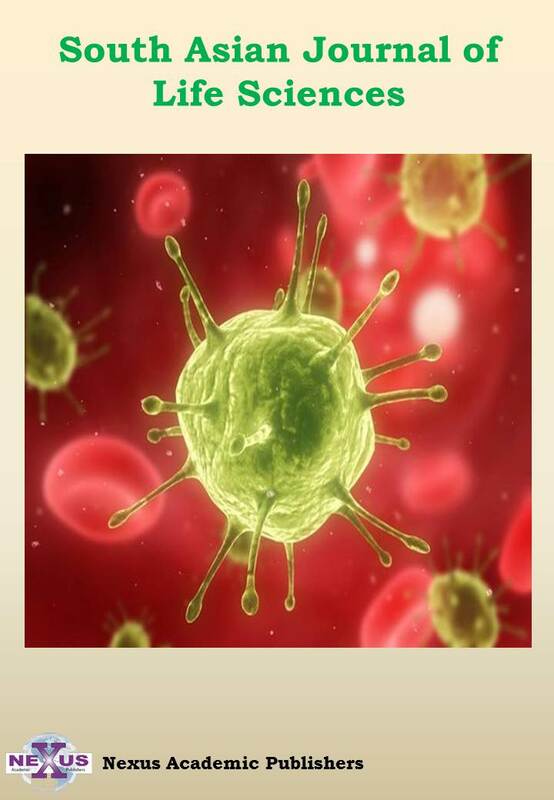 However, the particular mode of action on immune cells and components is still ambiguous. In vivo and in vitro studies showed the immunostimulatory activity of propolis on murine peritoneal macrophages that is accompanied by an increase of microbicidal action, and stimulation of the lytic effect of NK (natural killer) cells (Sforcin, 2007; Dimov et al., 1991). The water-soluble extracts of propolis have been known to enhance the production of interlukin-1 from mouse peritoneal macrophages (Dimov et al., 1991). The indoleamine 2, 3-dioxygenase enzyme regulates immune functions via degradation of L-tryptophan into its metabolites that suppress the effect or T-cell functions and favores suppressor T lymphocytes differentiation. A single dose of ethanolic extract of propolis and/or its repeated administration within twenty-four hours increased the number of plaque-forming cells in immunized mouse spleen cells (Scheller et al., 1988). Toll-Like Receptors (TLRs) play a very important role in microorganisms’ recognition and activation of the adaptive immune response. It is observed that propolis prevents the early stages of the immune response by down regulating the expression of TLR2 and TLR4 and the synthesis of pro-inflammatory cytokines, suggesting that propolis could modulate the innate immune responses (Orsatti et al.,2010). Caffeic Acid Phenethyl Ester (CAPE), a component of propolis mediates the immuno-stimulatory effect by increasing phagocytic activity, and thus strengthening the proportion of CD4 to CD8 T cells (Banskota et al., 2001b; Castaldo and Capasso, 2002; Girgin et al., 2009). CAPE exerts robust anti-inflammatory effects, suppresses T cells activities, and impedes store-operated Ca2+entry channels and K+ channels, which may be a mediator sign in activating immune parameters (Nam et al., 2009). Numerous experiments have reported the hepato-protective activities of propolis in liver injuries (Table 1). The ethanolic extract of propolis at 10 mg/kg remarkably reduces the level of serumtriacylglyceride, transaminases and hepatic triacylglyceride, while a dose of 30 mg/kg could lead to the prevention of fatty liver degeneration induced by the long term intake of alcohol (Lin et al., 1997). The liver protective impacts of the alcoholic extract of Brazilian propolis have been attributed to its significant phenolic contents, like flavonoids and others labdane-type diterpenes that were isolated from the propolis alcoholic extract (Banskota et al., 2001a). The study of El-Khatib et al. (2002) considered the aqueous propolis extract as a strong hepato-protective agent against the CCl4-incduced injuries of hepatocytes. Collective evidences indicate that propolis possess a distinct hepatoprotective activity due to its chemical constituents (i.e., phenolics, diterpenes and bio-flavonoids). The cardio protective activities of bee propolis are mediated through its numerous antioxidant components as shown in Table 1. Flavonoids, a major group of propolis ingredients are known as potential natural iron chelators and antioxidants. They appeared to play an important role as cardio protective agents in doxorubicin-induced cardiac toxicity caused by the production of oxygen free radicals (Marcucci et al., 2000). However, the specific mechanism of action induced by flavonoids found in propolis is not yet fully elucidated. Ethanol extract of propolis at ten-fold dilution exhibited the best radical scavenging action compared to quercetin and tocopherol (Nam et al., 2009). These findings support the hypothesis that the cardio-protective potential of bee propolis could be associated with the radical scavenging action of CAPE (Horakova et al., 2001). Furthermore, the supplementation with propolis significantly reduces the serum concentrations of triglyceride, cholesterol, nitric oxide, very low density lipoprotein (LDL) cholesterol, nitric oxide synthase (NOS), plasma glucose and malonaldehyde in fasting murine models, while improves the circulatory levels of high density lipoprotein (HDL) cholesterol and superoxide dismutase activity, indicating that propolis could play a role in normalizing the metabolism of circulatory fats (Huang et al., 2005). Table 1: The biological activities of propolis and its constituents. (De Sousa et al., 2007; Gómez-Romero et al., 2007). Antioxidant activity of propolis polyphenols is a result of their significant potential to chelate metal ions, scavenge reactive oxygen species and to reduce the synthesis of free radicals as well (Ahn et al., 2004; Kumazawa et al., 2004). Among propolis constituents, 3-prenyl-4-hydroxy-cinnamic acid possess distinct antioxidant activity, while artepillin C exerts incredible free radical reducing and scavenging activity (Nakanishi et al., 2003). The anti-inflammatory effect of propolis has been summarized in Table 1. It reduces the synthesis of leukotrienes and prostaglandins by suppressing the activities and expression of lipoxygenases and cyclooxygenases (Figure 3), and by inhibiting gene expression of TNF-α-mediated NF-kB, nitric oxide synthase, and diminishing immune activities in T lymphocytes (Mirzoeva et al., 1996; Woo et al., 2005). The suppression of NF-kB activity might be the molecular base for the anti-inflammatory activities of propolis. Furthermore, Woo et al. (2005) demonstrated the activities of chrysin (an important ingredient of propolis) on the expression of COX-2 (cyclooxygenase-2) in LPS (lipopolysaccharide)-stimulated RAW 264.7 cells. The aqueous extract of green Brazilian propolis has been reported for its anti-inflammatory and anti-angiogenic effects in murine sponge model and it can be concluded that both anti-angiogenic and anti-inflammatory effects of propolis are linked with endogenous production of TNF-α and TGF-β1 cytokines (De Moura et al., 2011). In conclusion, numerous evidences support that propolis could play a mediating role against the chronic inflammatory diseases in human and animals. It has been shown that propolis possesses a wide range of antimicrobial activity against the pathogenic microorganisms (Table 1), including viruses, bacteria and fungi (El Hady and Hegazi, 2002; Popova et al., 2009). In some studies, the Brazilian propolis extracts have been found to exert strong antimicrobial effects, particularly against the Gram-positive bacteria (Bankova et al., 1995; Sforcin et al., 2002). The high concentration of propolis’ ethanolic extract notably reduced the viable Salmonella counts in vitro, thus implying that the propolis could be used as an alternative agent for controlling Salmonella infections (Nam et al., 2009). The purified and concentrated D extract of propolis had also demonstrated a significant antibacterial activity against Multidrug-Resistant (MDR) bacterial isolates (Astani et al., 2013). Both ethanolic and aqueous propolis extracts exerted a strong antiviral potential as shown in Table 1, particularly against herpes simplex viruses (HSV-1 and HSV-2) (Schnitzler et al., 2010) and influenza viruses (Shimizu et al., 2008). It has been suggested that the robust propolis anti-microbial properties against a wide range of Gram-positive bacterial pathogens and a usual effect against Gram-negative organisms as well as its significant antiviral action is due to its high contents of bioflavonoids (Kamboh et al., 2015; Kamboh et al., 2017; Nolkemper et al., 2010). According to the published data, it is clear that the components of propolis can have potential beneficial effects against microbial infections, hypertension, cardiovascular disorders, diabetes, and several chronic diseases (Astani et al., 2013; Babinska et al., 2013). It is confirmed that several therapeutic impacts of propolis are due to its anti-oxidative, immuno-modulatory and anti-inflammatory activities. 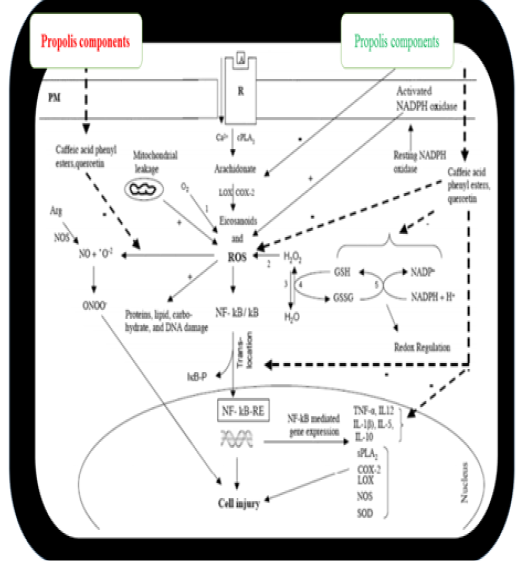 A potential hypothesis underlying the molecular mechanism of propolis-mediated protective effects has been presented in Figure 3. Dysfunction of mitochondria is the major factor of ROS production (O-2, H2O2, and -OH), which leads to hypertension, diabetes, allergies, and asthma. The high production of ROS involves oxidative injury to cellular components (nucleic acids, proteins and lipids) of tissues (Figure 3). Moreover, several other mechanisms are also involved in the generation of ROS. Enzymatic and non-enzymatic oxidation of PUSFA like arachidonic acid (ARA; 20:4) produces ROS (Farooqui and Farooqui 2009). Interactions of USFA with the trace metal ion Fe3+ also resulted in the per-oxidation of fatty acids and an intensification of ROS production. ROS are also generated by NADPH oxidase (Figure 3). The components of propolis likequercetin, p-coumaric, caffeic, ferulic acids, CAPE and chrysin block the production of inflammatory mediators by suppressing the expression of lipoxygenases, cyclooxygenases, phospholipase A2, and nitric oxidase synthase (Michaluart et al.,1999; Song et al., 2002). Additionally, other propolis components also inhibited the production of NF-kB (Figure 3) by blocking its translocation to the nucleus (Khayyal et al.,2003). Figure 3: Signal transduction pathways depicting the generation of ROS, activation of NF-kB, redox status and gene expression during oxidative stress, and propolis-mediated protective mechanism, glutathione peroxidase; glutathione reductase; NADPH oxidase; catalase; cytosolic, secretory phospholipase A2(sPLA2); phospholipase A2(cPLA2); lipoxygenase (LOX); superoxide dismutase (SOD); cyclooxygenase-2 (COX-2), Peroxy nitrite (OONO-); nitric oxide synthase (NOS); nitric oxide (NO); cytokines, TNF-α and IL-1ß; reduced oxidized glutathione (GSSG), glutathione (GSH) and hydrogen peroxide (H2O2), Nuclear factor-kB (NF-kB); and Nuclear factor-kB response element (NF-kB-RE). (Source: Farooqui and Farooqui. 2010). Bee hive owners have observed sensitization to propolis, resulting in an allergic reaction with skin and mucous membrane irritations. Many cases of dermatitis like vesiculitis, eczema, pruritis and erythema have also been attributed to propolis, but it is still considered as a relatively non-toxic material (Burdock et al.,1998; Banskota et al., 2001b). The complete data regarding the toxicity of propolis are still poorly understood (Mohammadzadeh et al., 2007). Propolis product is a powerful sensor and should not be used in individuals that are suffering from an predisposition, particularly the allergy to pollen. Thus, healthcare advisors should be aware of the problems of allergies to propolis. Moreover, few individuals’ exhibit hypersensitivity to propolis (adverse impacts such as conjunctivitis, rhinitis, bronchospasm and skin rashes), therefore individuals who are hypersensitive or allergic to any of its components must avoid using propolis as whole or its constituents (Burdock, 1998). Many previous published studies suggested that propolis has a growth enhancing function potential. Zhijiang et al. (2004) fed chickens with 0.1% propolis and found that body weight increased by 2.03%. At the same time, body weight and daily weight gain of broilers were significantly increased after the dietary supplementation with propolis at 50,100, 150, 200 or 250 mg/kg (Shalmany and Shivazad, 2006). The feed intake and FCR were statistically improved in chickens fed diets supplemented with 250 or 400 mg propolis/kg diet (Hassan and Abdulla, 2011; Shalmany and Shivazad, 2006). Similarly, in another experiment, the FCR was also improved in Japanese quails fed diet contained 1g propolis per kg (Denli et al., 2005) and also in ducks that were fed propolis at 2 g/kg feed (Abdel-Rahman and Mosaad, 2013). The reported improvements in feed intake and FCR were also associated with improved flavour due to the propolis flavonoid, or due to components like 4-hidoxibenzoic acid and benzoic, which may enhance nutrient digestibility (Seven, 2008; Seven et al., 2012). Propolis also appeared to increase resistance to many stressors in some poultry species. Propolis addition enhanced the weight gain in heat stressed (5 g/kg of diet; Seven, 2008) and lead-exposed broilers (1 g/kg of diet; Seven et al., 2012).Similarly, dietary supplementation with 2 or 5 g/kg of propolis enhanced body weight gain of layers subjected to heat stress (Seven, 2008) and these results may be related to its anti-oxidant properties (Tekeli et al., 2010; Abdel-Mohsein et al., 2014). Propolis has been envisaged to exhibit antifungal and antibacterial activities in embryonated eggs of layers, since it positively impacts the internal contents of the eggs and the microbiological quality and quantity of egg shells (Vilela et al., 2012). Therefore, propolis could be considered as a potential alternative of hatching eggs disinfectant in comparison with the synthetic chemicals currently used, since it does not adversely affect the hatchability traits and the hatched chick performance (Aygun et al., 2012; Vilela et al., 2012). Tekeli et al. (2010); Abdel-Rahman and Mosaad (2013) and Attia et al. (2014) confirmed the impacts of propolis on reducing mortality rate and attributed these findings to its vital role in absorption and metabolism of nutrients that cause changes in blood levels of total protein, amino acid and cholesterol. The above positive effects may also be related with the propolis ability to boost immune responses, such as the activity of macrophage and lymphatic tissues functions (Cetin et al., 2010; Freitas et al., 2011; Shihab and Ali, 2012). Abdel-Rahman and Mosaad (2013); Mahmoud et al. (2015b) reported that feather pecking and panting incidents were reduced after propolis dietary supplementation. These alterations have been attributed to the high nutritive value of propolis that can serve as a great growth enhancer leading to an improvement of the health status of the birds. Mahmoud et al. (2015 b) assumed that such behavioral changes were accompanied with the anti-oxidative properties of propolis because of its high flavonoids content, polyphenols and caffeic acid. Bonomi et al. (2002); Seven (2008) and Hassan and Abdulla (2011) stated that dietary supplementation with propolis induced positive effects on carcass parameters like dressing and carcass percentages in broiler chickens, ducks and quails. Chickens fed diet supplemented with 0.025% propolis for two weeks reduce themeat / bone ratio in carcass (Babinska et al., 2012). However, propolis supplementation at the level of 400 mg/kg diet significantly improves the liver weight in broiler chickens (Hassan and Abdulla, 2011). The counts of red blood cell were elevated after propolis supplementation in broilers (2-3 g/ kg of diet), layers (3g/kg of diet) and ducks (2 g/kg of diet) (Cetin et al., 2010; Shihab and Ali, 2012; Abdel- Rahman and Mosaad, 2013). Moreover, Cetin et al. (2010) and Shihab and Ali (2012) found that propolis dietary supplementation at the level of 3 g/kg both in broilers and laying hens resulted in an increase of IgG and IgM concentrations and also in a significant depression of T-lymphocytes in the serum when compared to control. The improvements in IgG levels in poultry treated with propolis may be attributed to the activation of B lymphocytes by increasing macrophage activity and elevating cytokines levels such asinterleukin-1, 2 and 4 (Park et al., 2004). The above findings could be attributed to the flavonoids and benzene compounds of propolis. Supplementation of propolis improved the antibody response against the avian influenza, Newcastle disease virus and infectious bursal disease (Taheri et al., 2005; Ziaran et al., 2005). In blood parameters, triglyceride and blood cholesterol levels were significantly decreased in propolis-fed layers (100-150 mg/kg of diet) and broilers (300 mg/kg of diet) (Galal et al., 2008; Attia et al., 2014), due to its anti-oxidizing activities. Propolis is considered to enhance biological functions, liver morphological structures and lipid metabolism (Matsui et al.,2004; Babinska et al.,2013). As reported in an experiment performed by Petruska et al. (2012), the propolis at the rate of 450 mg/kg resulted in a significant reduction of phosphorus levels in the serum of broilers. Moreover, in the same study, 150, 450, 600 or 800 mg propolis/kg diet reduced the magnesium content in the serum of broilers. Authors suggested that inclusion of propolis in broiler diets increased the absorption of magnesium and phosphorus from the blood to the bone, resulting in reduction of magnesium and phosphorus level in the blood. Tekeli et al. (2010) supplemented broilers’ diet with propolis at the dose of 1000 mg/kg and reported that the length of intestinal villi was significantly increased. Galal et al. (2008) and Abdel-Mohsein et al. (2014) reported that supplementation with propolis at 100 or 150 mg/kg layer diet significantly reduced alanine amino transferase and aspartate aminotransferase activity compared to the controls. Propolis is defined as a natural resinous hive product that is collected by honey bees. It contains several chemical bioactive compounds like polyphenols (phenolic aldehydes, flavonoid aglycones, phenolic acids, alcohols and their esters and ketones), steroids terpenoids, amino acids and inorganic compounds. It possesses many biological properties, including antiviral, antioxidant, antibacterial, hepatoprotective, antifungal and immuno-stimulating activities. Theafore mentioned scientific findings and a growing number of evidences suggest that the impacts of propolis on health, performance as well as welfare of poultry are influenced by many factors like its dosage, type, and levels of active components. The positive results of propolis on poultry performance and health support its well-known biological role as growth enhancer, antioxidant, immunomodulator, antibacterial, and suggested that the use of propolis as a natural supplement would be promising in poultry industry. Moreover, propolis could be used for the alleviation of oxidative stress in farm animals and poultry, thus may be used to overcome stress. Further research on finding the ideal techniques for the practical application of propolis on a commercial level in poultry farming is still required. All the authors of the manuscript thank and acknowledge their respective Universities and Institutes. 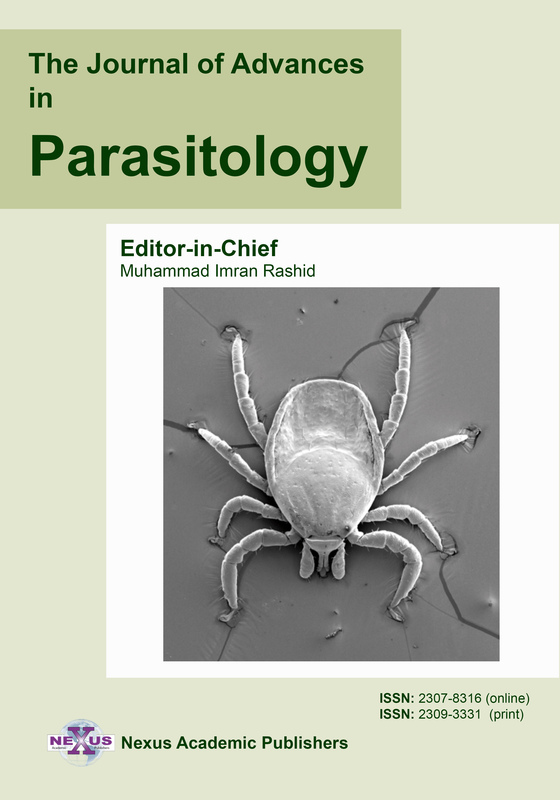 All the authors contributed equally and significantly to compile and revise this manuscript. Muhammad Saeed, Muhammad Asif Arain, Asghar Ali Kamboh, Shafique Ahmed Memon Muhammad Umar, reviewed the literature and initiated the review compilation. 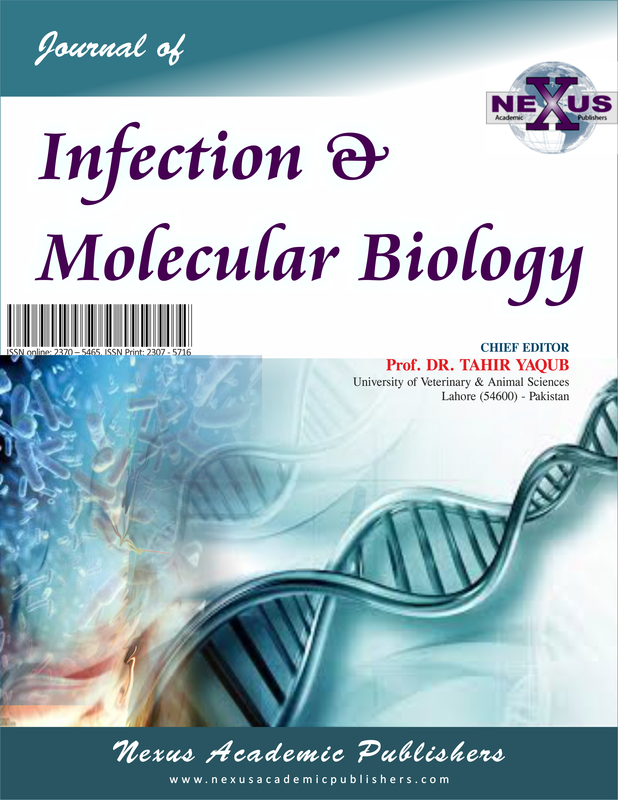 Muhammad Rashid, Daryoush Babazadeh, updated the general aspects while Mohamed E. Abd El-Hack, Mahmoud Alagawany critically edited and finally reviewed the manuscript. Finally all authors read and approve the final draft for publication. •	Abdel-Rahman MA, Mosaad GM (2013). Effect of propolis as additive on some behavioural patterns, performance and blood parameters in Muscovy broiler ducks. J. Adv. Vet. Res. 3 (2): 64-68. •	Aguihe PC, Kehinde AS, Ospina-Rojas IC, Murakami AE (2017). Comparative effect of different detoxified rubber seed meal on haematological and serum biochemical indices of broilers. J. Anim. Health Prod. 5(2): 50-57. •	Ahossi PK, Dougnon JT, Kiki PS, Houessionon JM (2016). Effects of Tridax procumbens powder on zootechnical, biochemical parameters and carcass characteristics of Hubbard broiler chicken. J. Anim. Health Prod. 4(1): 15-21. •	Arain MA, Mei Z, Hassan FU, Saeed M, Alagawany M, Shar AH, Rajput IR (2017). Lycopene: a natural antioxidant for prevention of heat-induced oxidative stress in poultry. World’s Poult. Sci. J.74 (1) (Accepted). •	Astani A, Zimmermann S, Hassan E, Reichling J, Sensch K, Schnitzler P (2013). Antimicrobial activity of propolis special extract GH 2002 against multidrug-resistant clinical isolates. Die Pharmazie-An Int. J. Pharma. Sci. 68 (8): 695-701. •	Babinska I, Kleczek K, Makowski W, Szarek J (2013). Effect of Feed Supplementation with Propolis on Liver and Kidney Morphology in Broiler Chickens. Pakistan Vet. J. 33 (1): 1-4. •	Bankova V, Christov R, Kujumgiev A, Marcucci MC, Popov S (1995). Chemical composition and antibacterial activity of Brazilian propolis. Zeitschrift für Naturforsch C. 50 (3-4): 167-172. •	Bonomi A, Bonomi B, Quarantelli A, Sabbioni A, Superchi P (2002). The use of propolis in duck feeding. Rivista di Scienza dell’Alimentazione. •	Hassan M, Abdulla T (2011). The effect of propolis feed supplementation on hygiene and performance of broiler chickens. Iraqi J. Vet. Sci. 25 (2): 77-82. •	Kamboh A, Memon A, Mughal M, Memon J, Bakhetgul M (2017). Dietary effects of soy and citrus flavonoid on antioxidation and microbial quality of meat in broilers. J. Anim. Physiol. Anim. Nutr. https://doi.org/10.1111/jpn.12683. •	Kara K, Güclü B, Oguz FK (2014). 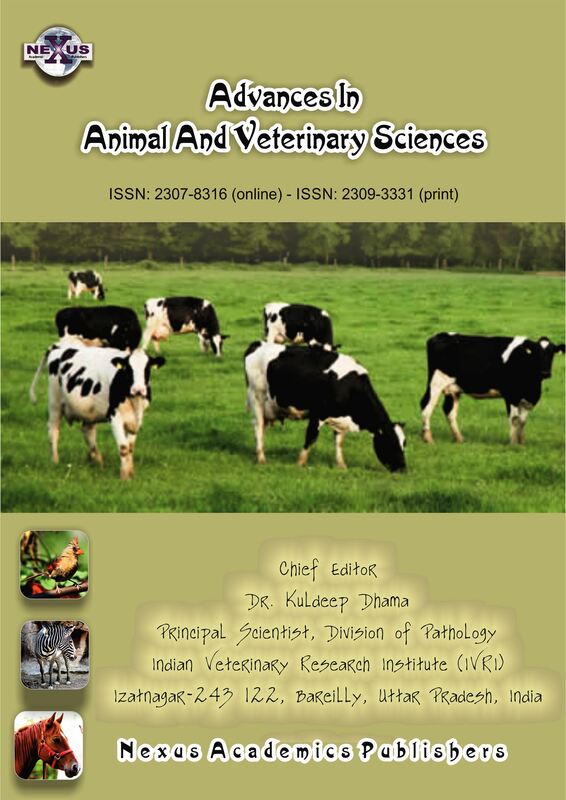 Use of propolis and phenolic acids in ruminant nutrition. J. Fac. Vet. Med. Univ. Erciyes. 11: 43-53. •	Loke WM, Hodgson JM, Proudfoot JM, McKinley AJ, Puddey IB, Croft KD (2008). 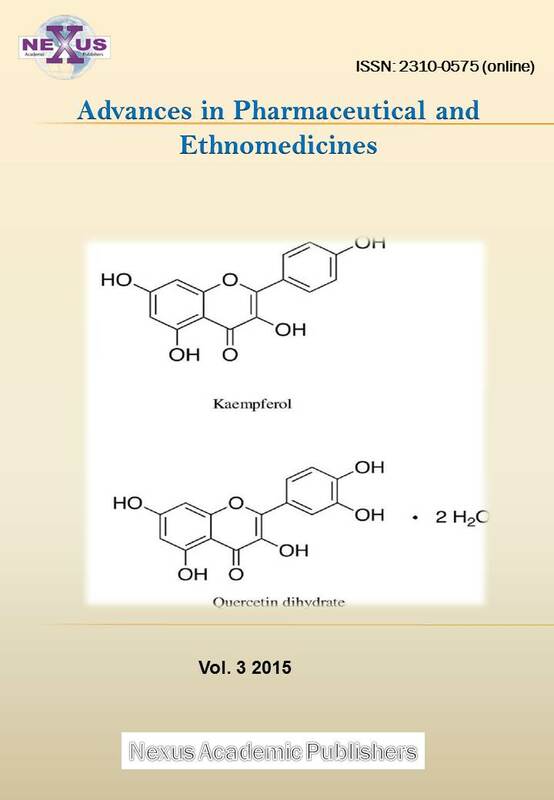 Pure dietary flavonoids quercetin and (-)-epicatechin augment nitric oxide products and reduce endothelin-1 acutely in healthy men. Am. J. Clin. Nutr. 88 (4): 1018-1025. •	Michaluart P, Masferrer JL, Carothers AM, Subbaramaiah K, Zweifel BS, Koboldt C, Mestre JR, Grunberger D, Sacks PG, Tanabe T, Dannenberg AJ (1999). Inhibitory effects of caffeic acid phenethyl ester on the activity and expression of cyclooxygenase-2 in human oral epithelial cells and in a rat model of inflammation. Cancer Res. 59 (10): 2347-2352. •	Petruska P, Tusimová E, Kalafová A, Hascík P, Kolesárová A, Capcarová M (2012). 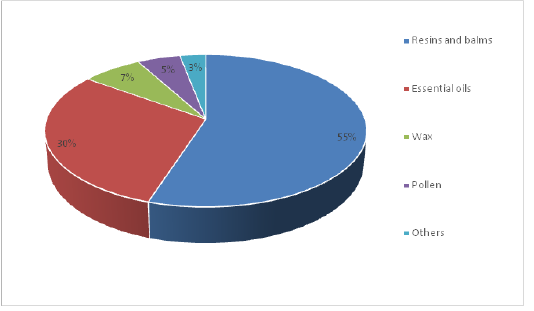 Effect of propolis in chicken diet on selected parameters of mineral profile. J. Microbiol. Biotechnol. Food Sci. 1 (4): 593. •	Seven PT, Yilmaz S, Seven I, Kelestemur GT (2012b). The effects of propolis in animals exposed oxidative stress. Oxidative Stress-Environmental Induction and Dietary Antioxidantsed., InTech. 267-288. •	Sforcin J, Kaneno R, Funari S (2002). Absence of seasonal effect on the immunomodulatory action of Brazilian propolis on natural killer activity. J. Venom. Anim. Toxins. 8 (1): 19-29 https://doi.org/10.1590/S0104-79302002000100003. •	Shihab I, Ali B (2012). Effect of propolis in diet supplementation on the immune response against Newcastle disease and hematological picture in broiler chicks. Al-Anbar J. Vet. Sci. 5: 40-46. •	Zhijiang Z, Sanfeng L, Ke P, Hongxiang W, Kaijie T (2004). Effects of pollen and propolis on productive and immune performance in meat fowl. Zhongguo nongye kexue. 37 (5): 751-755.